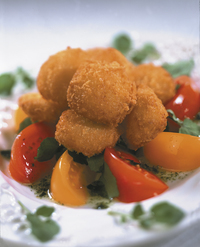 Our succulent, sweet, untreated scallops are coated in Panko breadcrumbs to deliver a juicy and satisfying taste. Sourced from the purest waters, Mrs. Friday's® scallops are carefully prepared and individually quick frozen to retain their naturally delicious flavor. Sizes for every menu application. INDUSTRIAL FRYER: In deep fryer, heat oil to 350°F. Add scallops, shaking baskets to prevent scallops from adhering. frying for 2 - 2 1/2 minutes. HOME FRYER: 1. In deep fryer or 3-quart saucepan, heat oil to 375°F. Add no more than eight scallops at a time. Separate scallops to prevent them from adhering. frying for 2 1/2-3 minutes. 2. In deep frying pan, heat 1" of oil to 375°F. Place no more than eight scallops in at a time. Cook as directed above, but turn scallops over halfway through cooking. NOTE: The correct oil temperature is very important to insure proper browning. If thermometer is unavailable, test oil temperature by dropping a few pieces of loose breading into the oil. Oil is hot if bread crumbs immediately sizzle and float to top. Always allow oil to reheat before adding additional scallops.